The recent flood of immigrants across America’s southern border is sparking heated discussions about what to do with the tens of thousands of children and other illegal immigrants swamping our border enforcement. Some say we should send them home, others say we should care for them, grant them amnesty, and welcome them as American citizens. 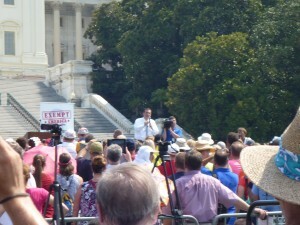 The critical question that must be answered first is where is America’s breaking point? Certainly the left would answer that the United States is the most powerful country on earth. Certainly we can care for a few tens of thousands or over time hundreds of thousands but starving helpless children. Taken as an isolated problem, the answer is of course yes, America could afford to care for them. The problem is, that this is not an isolated problem. Deciding to care for hundreds of thousands of new indigents is not America’s only burden. Collectively, they are becoming insurmountable. This discussion requires an analogy to bring it into focus. Michael Phelps is the most decorated athlete in the history of Olympic sports. He currently has a total of 22 Olympic medals: 18 gold, 2 silver, and 2 bronze. His strength power and speed in the pool is legendary. Let’s take Michael Phelps and say that he was in a lake surrounded by people struggling to stay afloat. Each one of them was carrying a small weight some the size of the BB, others a small rock, and still others weighing several pounds. In order to save their lives let us assume that Michael Phelps began to take on their burdens. From some he would take a BB, and the impact would be nearly unnoticeable at first. His ability to swim to the next struggling person and take on their weight unhampered. As Michael moved from drowning person to drowning person one can see a time when he would shift from being the rescuer to being in danger of drowning himself. At some point the weights that Michael Phelps would be forced to carry would drag under the greatest swimmer in the history of mankind. This analogy is meant to show what many don’t understand. America does have limits. How many burdens can we take on before like Michael Phelps we would succumb to their combined weight and sink below the surface? America is $17.6 trillion in debt and climbing. The “War on Poverty” has cost the American tax payers $22 trillion so far. We’ve gone from adding BBs every year to adding large rocks as the weight of the interest on that debt mounts. Every month the percentage of people working in this country, acting as Michael Phelps, declines. Regulations, terrible burdens on businesses of all sizes, pour from nearly every federal agency. Obama care alone is responsible for tens of thousands of pages of regulations. America’s social safety net is at the point of collapse adding even more weight to a crop and economy struggling to stay afloat. The world is becoming ever more dangerous with a resurgent Russia, aggressive China, and spread of radical Islam. With all of these burdens, the cumulative affect of adding hundreds of thousands of more illegal immigrants to this country comes into focus. Where is America’s breaking point? All American’s should be frightened to face this question. America is the greatest force for freedom in the history of mankind, and yet now we must question how long she can stay afloat? Purdy: Olympic champ Michael Phelps’ comeback crazy, or brilliant? It’s a real tragedy that he is so fixated on global warming when he should make precisely the same warning about our national debt. 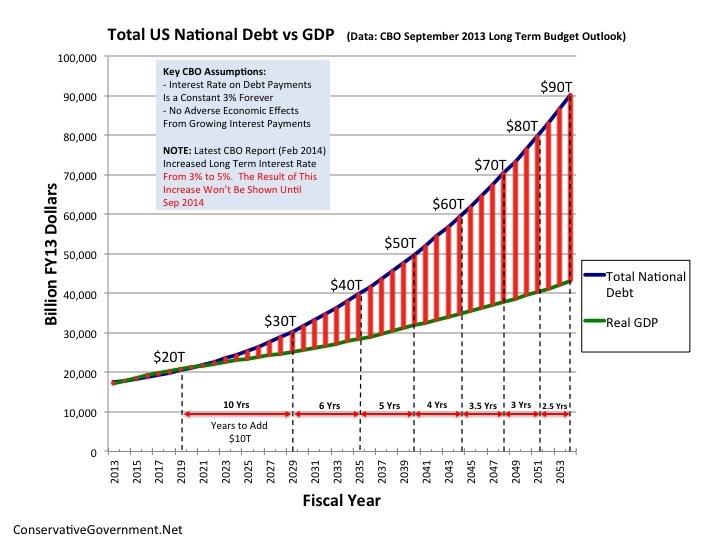 Let’s look at the reality of the mounting debt, as opposed to the invented 100 year global warming crisis. Yes Mr. President, you got that right. In a few short years at your current rate of dangerous spending, debt interest payments alone will exceed a Trillion dollars each year. That’s far greater than the defense budget, and billions of that interest will go to China, so that they can build up their military as we dismantle ours. Right again Mr. President. The massive debt will result in rapidly rising interest rates, and is unsustainable according to the Congressional Budget Office. Businesses will go under, and Americans will lose their jobs, properties and homes when they can’t pay their mortgages due runaway interest rates and rampant inflation bound to come. Long before the ocean swallows New York City, our debt will swallow America. Mr. President, no more accurate statement could be made than that we are foisting an impossible debt burden upon our kids and our grandkids. Their future America will be crippled by the excessive spending you, your administration and reckless Democrats and Republicans created. You will go down in history as the greatest debt creator in all of human history. Given his statement on saving American’s future, however wrong global warming is, it’s clear that President Obama can think strategically, with an eye on the future. Why, why, why then can’t he use the same foresight to address our debt? Why aren’t there democrats screaming with a global warming-like fervor to stop the destruction of our economy? Why indeed? 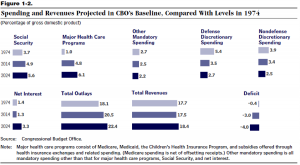 The following quotes were taken from the CBO’s own report, found here. They tell the very frightening story that if our country doesn’t change the fiscal path that it’s on under the Democrat’s tax and spend policies, our country is headed for a disaster. We need to stand up, get vocal, vote out the spenders and force our elected officials to balance the federal budget, before the mounting trillions that we owe dooms us! 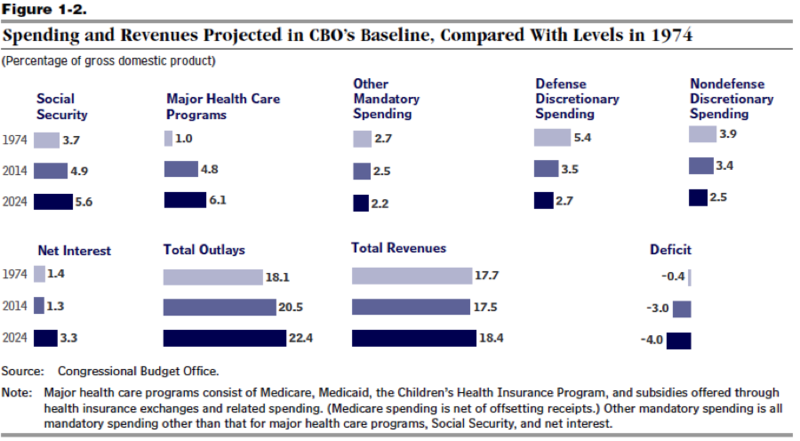 In the below chart, also from the OMB report, note that the discretionary items in the budget get squashed by mandatory spending of interest, social security, and major health programs.